for Ross and Cromarty, Skye and Lochalsh 2015 – Alasdair MacDonald, S4, was nominated and won the Helping Others category. Well done to Alasdair for the recognition achieved by this award. Gairloch High School Indoor Rowing Team was commended in the Group Award as was the local ATC. Well done to all the adults who have encouraged and supported the local youth. It is good to see that dedication and hard work recognised by the Lord-Lieutenant, Mrs Janet Bowen. The purpose of the Award Scheme is to recognise and celebrate the many positive activities and achievements of young people across Ross and Cromarty, Skye and Lochalsh. A full list of winners is available on the Lord-Lieutenant’s website. Europe comes to Gairloch High School – On the 19th of April, our Comenius friends will be arriving in Gairloch having travelled from Latvia, Portugal, Poland, Greece, Turkey and Finland. Unfortunately, our Spanish friends will not be joining us. It is going to be hard to match the hospitality, kindness and fun we have all had in their countries, but we are all going to try very hard to do so. There are various events planned for the week, including a visit to the Kelpies, Loch Ness and (of course) a distillery. On Wednesday 22nd of April from 7pm, there will be a Ceilidh in the Community Centre, and we invite all our friends and parents in the community to join us. We will be dancing the usual dances, but trying to teach the Comenius group how it’s done at the same time. On hand to provide entertainment will be the Gairloch Pipe Band, Mrs Browne’s Highland dancers, and C for Craic. A great night will be had by all. There will be a raffle, and any contributions will be very welcome. Refreshments will also be available at the interval. 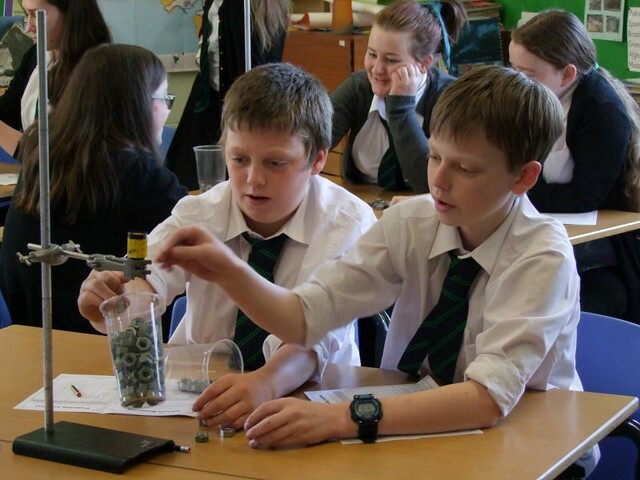 GeoBus and Explosions – On Wednesday 25th March two geologists from the University of St Andrews visited with GeoBus. This is an industry-supported project that aims to support earth science education in schools and has visited Gairloch in previous years. Kathryn and Carina worked with S1-S3 classes using fun activities to teach and build on the earth science in the Geography and Science curricula. 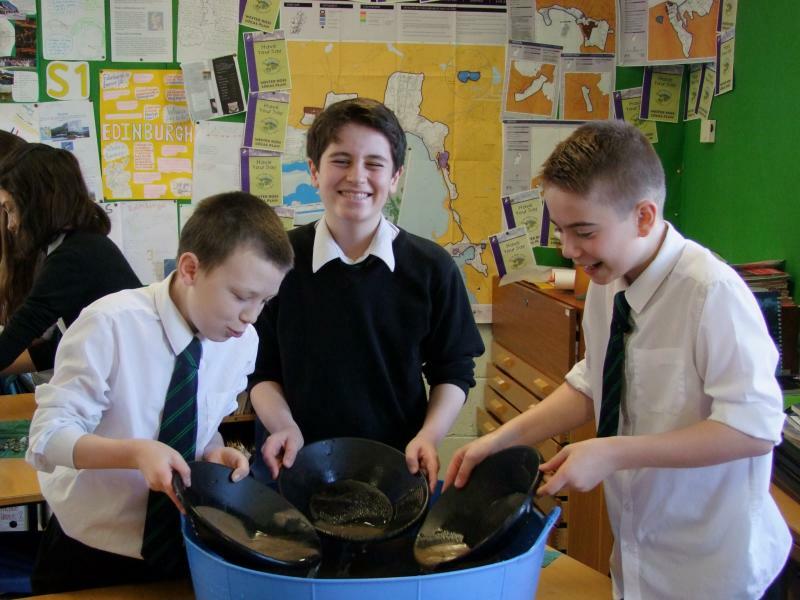 The S1 Geography class was treated to a minerals workshop – but first they had to find the minerals! They learned about panning and put their technique to the test fishing minerals out of a sand/water mix (our pretend rivers). They found minerals of all shapes and sizes, some which were more familiar than others. They sorted them and tried to identify them using the hand lenses and a mineral guide. We then talked in more detail about a few of the minerals – muscovite mica and pyrite – before each group picked their favourite mineral and shared it with the rest of the class. 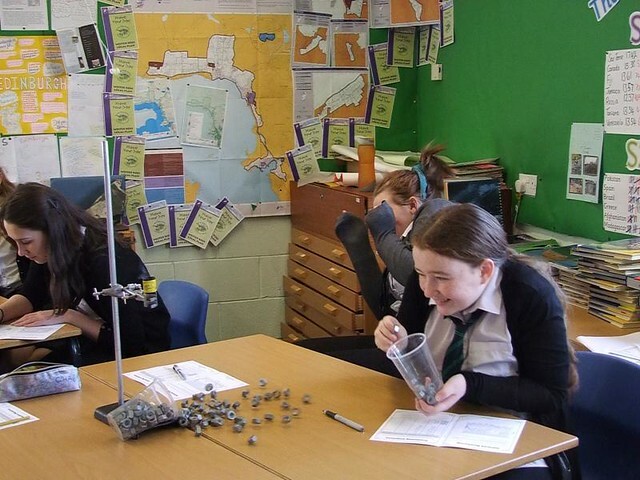 The S2 Geographers have just started a new unit looking entitled “Explosive Earth” and there were plenty of explosions during the “Monitoring Volcanoes” workshop! Pupils set up their own experiments with party poppers and weights to simulate magma building in a lava dome. There were plenty of screams when the party poppers erupted! Groups then had to predict their next eruption and make a decision about when they were going to evacuate. There was only one group whose volcano erupted before they had decided to begin an evacuation! Other techniques that are used to monitor volcanoes were also shown including infrared cameras and seismometers. Those who do Geography in S3 spent the afternoon learning lots about plate tectonics and the natural hazards that come with them. They looked at the evidence for continental drift, the nature of the mantle, the frequency and size of earthquakes, the explosive capability of different volcanoes, calderas and evidence of volcanism, volcanic gas and finally the issue of dealing with tsunamis! 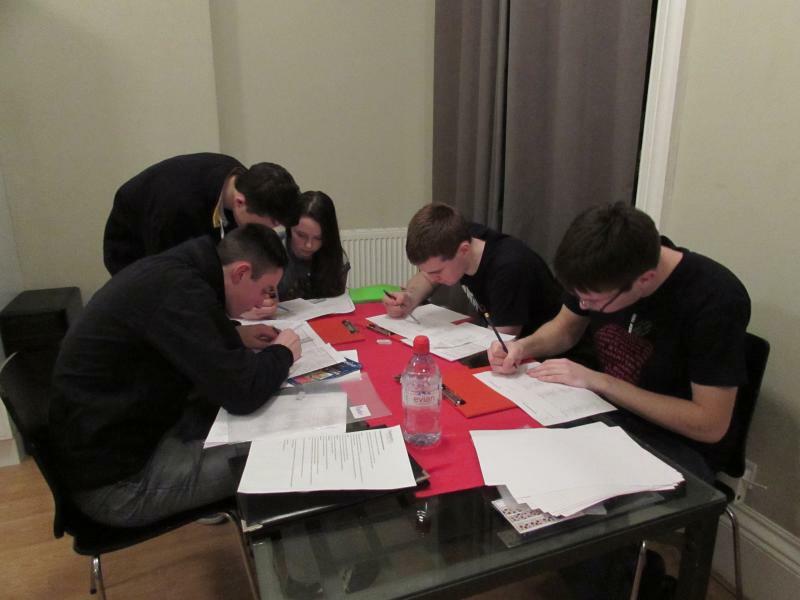 Kin and the Community – Sara Johnston (S3) writes, “I am one of 6 young people from Ross-shire chosen to be part of this new exciting project run by Fèis Rois and funded by the Highland Youth Arts Hub. The project is inspired by the fiddler Duncan Chisholm’s ground breaking multimedia project, Kin. We will be supported by Duncan Chisholm as the Artistic Director to make a short film about 20 minutes long. This project involves composition and music making, ethnology and research, filming techniques, editing and narration. The film will include an old voice recording of someone talking about an interesting part of their lives, filming to go along with the voice recording and music composed by us. We have already been to the Highland Archive Centre and the School of Scottish studies in Edinburgh to try and dig out a fascinating old recording of someone from the Ross-shire area. The premiere of this project will be performed on the 4th July in Ullapool at the MacPhail Centre. Whilst the film is running we will be performing the music that goes along with the film live. We are planning another opportunity for members of the community to try out some of the activities that the pupils have been involved in as part of the Rolls-Royce Science Prize. Visitors will have the chance to build on the DNA evening we held in November by carrying out DNA profiling, guided by pupils. It is hoped that former pupil and DNA scientist Jennifer Port will return to lead the session. There will also be the chance to try out some modern microscopy techniques and hear about senior pupils’ Advanced Higher projects. Because of the practical nature of the evening places are limited so please phone the school (01445 712275) to notify us your interest. Important Dates – School opens again for all on Monday 20th April. There will be a Comenius ceilidh with lots of pupils and visitors involved on Wednesday 22nd April in the Community Hall. All welcome! S3 Parents’ Evening is on Wednesday 29th April. S2 reports will be issued on Friday 24th April with the Parents’ Evening on Thursday 7th May. SQA national exam timetable begins on 30th April. Swimming gala and beach clean up reports next issue. Further details of events on the school website calendar. Duke of Edinburgh’s Award success – Gairloch had a surprise inspection of its DofE Operating Partnership Agreement recently. Miss MacAllister who manages DofE provision within the school received a glowing report. In 17 out of 19 indicators Gairloch High gained 1 on a 4-point scale. The two areas where we struggled were with partnerships with other groups and fundraising access both due to our remoteness – and this was acknowledged in the feedback. Congratulations to Miss MacAllister and all the adults who help with providing DofE opportunities to our pupils. Your support is appreciated. 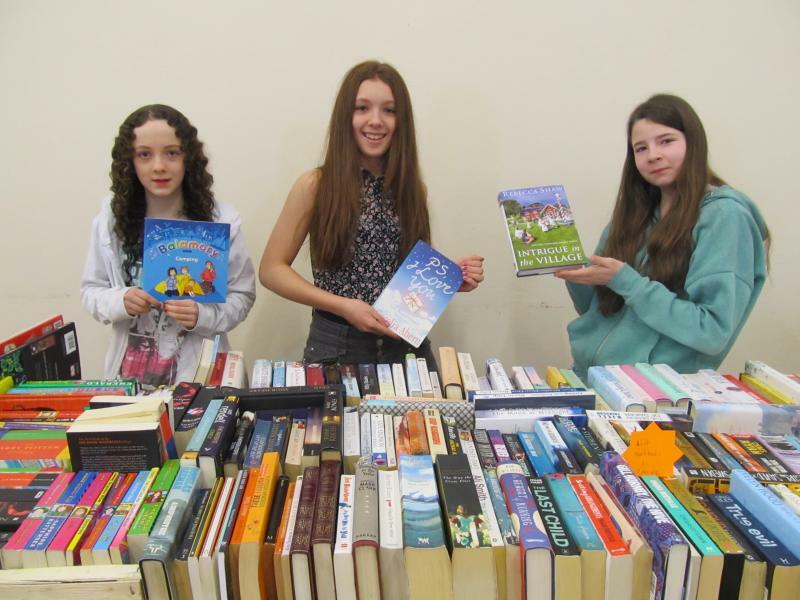 PUPIL REPORT of S1 Bring and Buy Sale – On Saturday the 14th March we held our S1 Bring and Buy Sale to raise money for our trip to the Cairngorms. Thank you to everyone that donated prizes, let us put up posters, donated things to sell and who came along on the day. The sale was very successful and we raised £2,170 in total. We are particularly grateful for support from many individuals and the following businesses: Ross County Football Club, Landmark, Bridge Cottage Café, The Shieling, The Myrtle Bank Hotel, Gairloch Pharmacy, McColls, The Button Bothy, The Torridon, Gairloch Dental Practice, Forbes Garage, Kenneth Morrison’s Butchers, The Steading, Spiral, PNL Accounting, Sugar Croft Faerie, Whistlestop Café, The Treasure Chest, Shop at the Pier, Les Buchan, 916 Guiding, Mrs Banister (hamper) and The Badachro Inn (our apologies if we have missed anyone) – Quinlan, Melody and Isabelle (S1). 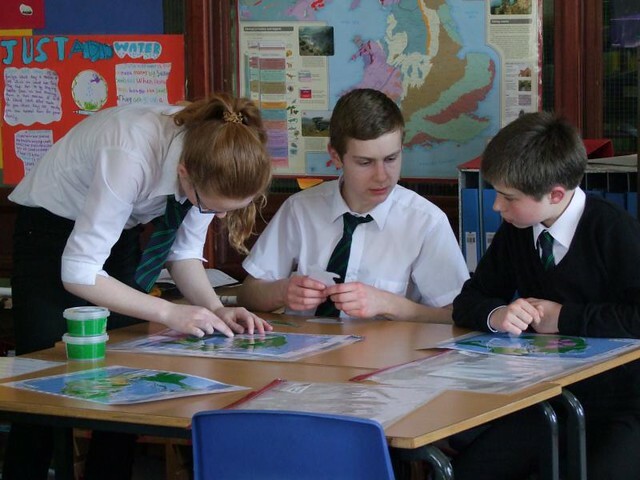 5×50 2015 – The Gairloch High School team is taking part in the 5×50 challenge again this year. The 50-day event started on Sunday 29th March and we have 44 pupils and a handful of staff signed up. There are several ways to complete the challenge. Option A – the original way to do it, involves running, walking, cycling, swimming or rowing a minimum of 5km a day every day. Option B offers more variety and is calculated by time rather than distance. Challengers are asked to complete a minimum of 30 minutes of activity per day. This could be doing the same activities as in option A, but in addition includes exercise classes, dancing classes and martial arts for example. If this still seems too daunting, Option C is for pairs – do 5km a day on alternate days or 2.5km each, every day. Exercise logs have been distributed to challengers and it is hoped that these will be completed accurately over the 50 days so that Mrs Johnston can inform the 5×50 organisers of our grand total come the 17th May. More information about the challenge can be found at www.5×50.org or at our GHS team Facebook page. 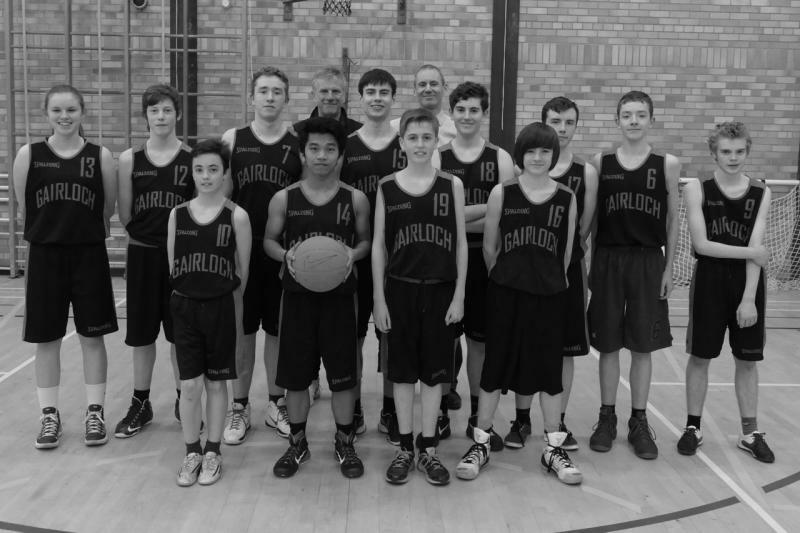 Basketball: Gairloch vs. Dornoch – The school hosted a game against Dornoch Academy recently. We mixed junior and senior pupils in a single team and lots of good play occurred. Unfortunately on this occasion Gairloch lost but well done Dornoch. On the Saturday we met with Matt from Historic Scotland at Holyrood Park. He told us about the park and his job as a ranger protecting and maintaining the rare plant species by locating suitable plots of land and promoting their growth. We learned about the geology of the park as well as wider Edinburgh. Study Club – Easter Study Club will take place this year during the holidays on Tuesday 7th to Thursday 9th April inclusive. Currently about half of S4 to S6 pupils have signed up to attend tutorials and work sessions during the holiday to prepare for their upcoming SQA national exams. Important Dates – School closed for Easter on Thursday 2nd April however Study Club for S4-6 pupils is on Tuesday 7th, Wednesday 8th and Thursday 9th April inclusive. School opens again for all on Monday 20th April. This will include our Comenius visitors from Europe. There will be a Comenius ceilidh with lots of pupils and visitors involved on Wednesday 22nd April in the Community Hall. 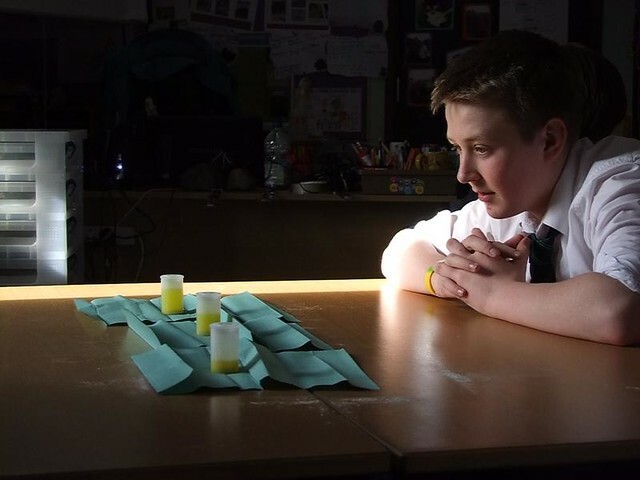 Eclipse / Rolls-Royce Science Day – Gairloch pupils recorded eclipse data as part of a broad scientific partnership on Friday March 20th. The Science Day involved partnerships with University of Reading and the BBC, along with a visiting engineer from Rolls-Royce, Professor Barclay and STEM ambassador Jennifer Port from The Beatson Institute in Glasgow. 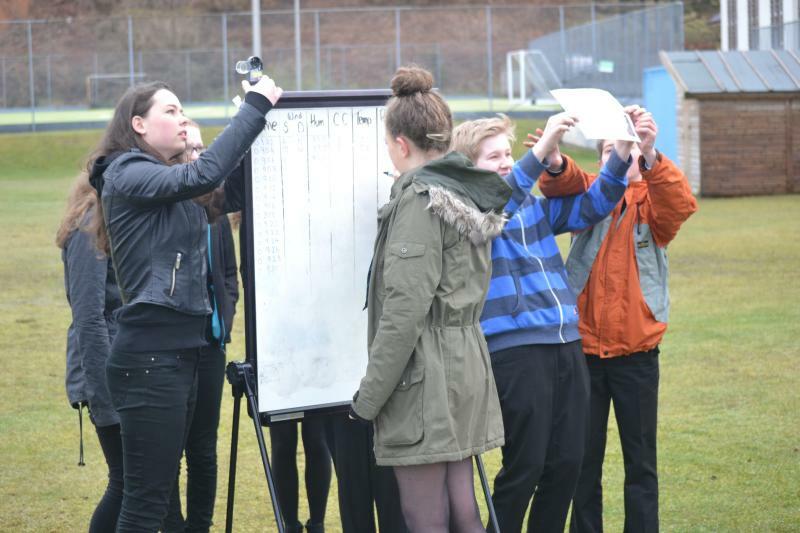 Through Gairloch High school’s participation in the Rolls-Royce Science Prize 2015, pupils used some of the equipment purchased with support of Rolls-Royce Science Finalist funding to make accurate recordings of weather conditions throughout the eclipse. The school has sent the weather data to the University of Reading’s National Eclipse Weather Experiment (NEWEx), which looks at the atmospheric impact of a solar eclipse. The school also hosted BBC reporter James Shaw. He worked with the pupils and interviewed them along with our Geography teacher, Miss Emma Smith. Gairloch pupils Joe Smith, Jack Wright and Isabelle Gallagher talked live on Radio 5 Live while Miss Smith’s interview was heard on the Radio 4 Today show (Friday 20th). 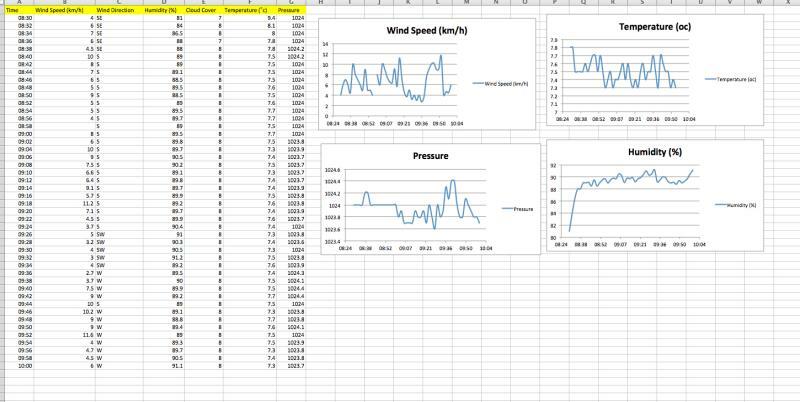 S3 and Higher Geography pupils recorded data throughout the eclipse using weather meters. 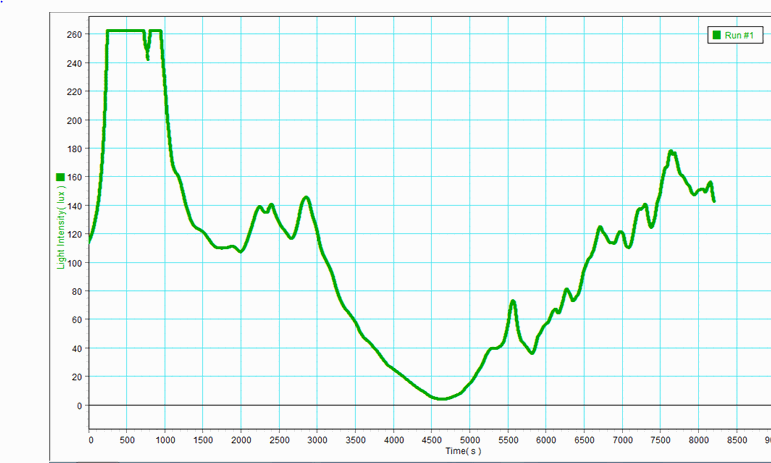 Between 9am and 10am, S1 pupils monitored temperature and cloud cover along with measurements of light levels (see graph). They had pinhole projectors made previously in science just in case the cloud cleared. At 9am, S2 received a talk from eminent forensic scientist Professor Dave Barclay. The theme of the talk was “Good Science” and what that involves. After the talk S2 joined the S1 outside as the eclipse maximum approached at around 9.37am. By this time most pupils and staff took the opportunity to experience the event. Unfortunately no images of the eclipse were viewed from the school due to cloud cover. After the eclipse shadow had passed S3 geography pupils started analysing the results gathered. They got some interesting results and the graphs generated a lot of discussion about what the evidence might infer about the effect of the eclipse on weather patterns. These graphs are available on the school website with annotated conclusions from the pupils. Just before lunch Professor Barclay talked to S3 pupils in English class about being an author. Using science as a theme, he set the pupils a writing challenge. After lunch the pupils started planning their own story and he will return in around 10 days to investigate the results of their writing task. Rolls-Royce engineer Neil Chattle is the school’s competition mentor and when he visited before, Neil gave willingly of his time to advise pupils on engineering apprenticeships. Pupils from S3 upward, who study technology and engineering courses in the school, met with Neil to talk about jet-engine failure analysis. Neil kindly brought some machined engine parts for the pupils to handle. Surprisingly some of the parts, which looked quite small, cost thousands of pounds to manufacture! You can see some photos of the event here. 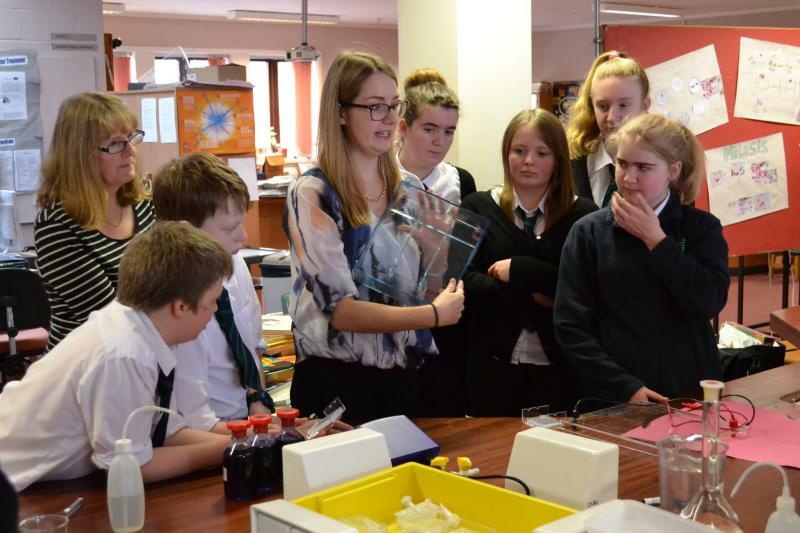 Meanwhile former pupil and STEM ambassador, Jennifer Port met with S2 pupils and continued the DNA analysis experiments started during her previous visit a few months ago. This time the pupils were learning profiling techniques and got the chance to practice lab skills. This session was similar to an event that Jennifer took part in at Anglia Ruskin University as part of our Rolls-Royce objective to spread skills to staff and pupils beyond the boundaries of our own school community. 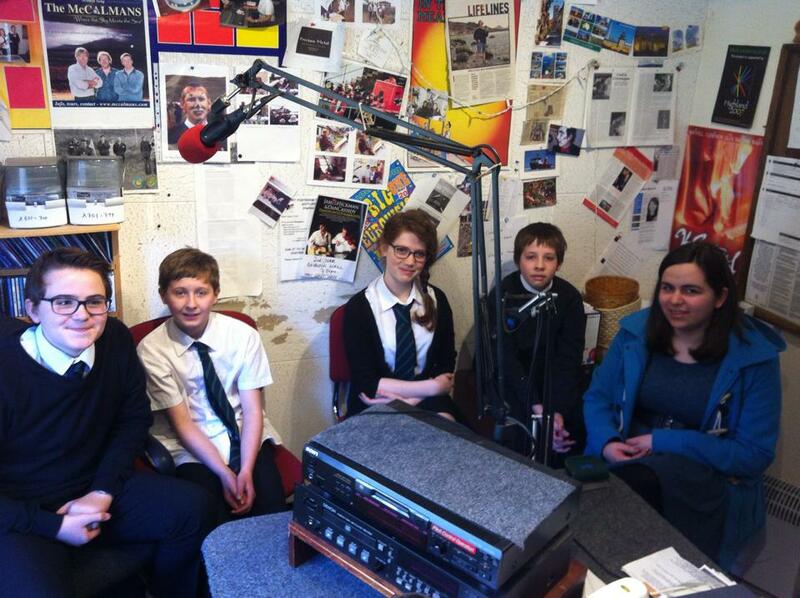 As a follow up Eilidh MacDonald S3, Kai Johnston (S2), George Pickering and Callum MacDonald (both S1) were interviewed on Two Lochs Radio and it was broadcast on Wednesday evening (25th March). Along with Miss Smith they talked about the science of the eclipse and other events such as making pinhole projectors and using light meters, geography data collection for the University of Reading, aerospace engineering, Professor Barclay writing crime fiction and DNA profiling experiments in Science. We are planning another community evening for Tuesday 28th April but booking your place will be essential. Details will be published in the next issue as part of the school news but we plan to include practical experiments and a chance for you to hear what our Advanced Higher pupils have been doing this year in Biology.